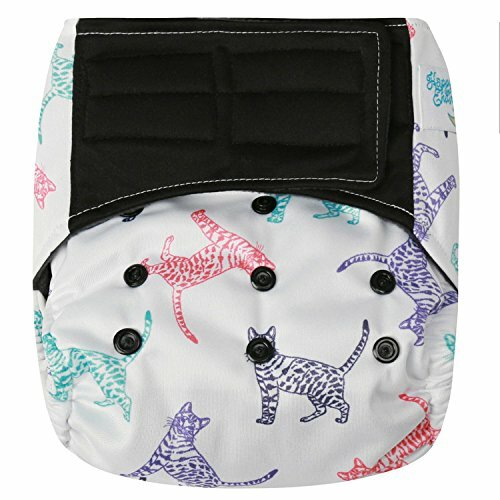 HappyEndings "Night Night" AIO (All in One) Hook & Loop Closure Diaper with an absorbent Sewn-in 4 Layer Soaker and a Pocket Option. Addition of a 13.5in. 5 layer charcoal bamboo insert for night, heavy wetters, travel, and nap time use. Features: Stay-Dry Charcoal Bamboo Fleece Inner lining or Micro Fleece Inner Lining -Ideal for babies who sleep through the night and/or get rashes due to wetness. The Sewn-in 4 Layer Soaker (2 layers of bamboo/2 layers of microfiber) makes this diaper an all-in-one. Sturdy and Gentle Covered double leg gussets for blow-out and leak prevention. Leak guard on the top inside of the diaper -great for tummy sleepers and boys. 4x3 adjustable rise snaps + adjustable velcro for the perfect fit. Velcro includes sturdy laundry tabs to protect your fabrics in the wash. The velcro on this diaper makes cloth diapering as simple as disposables for worn out Moms and Dads. HappyEndings is a Mama-run US small company dedicated to budget-friendly, functional cloth products for babies, kids, and adults. ONE SIZE FIT: Trim All in One design with adjustable 4x3 rise snaps (X-Small, Small, Medium, & Large) & adjustable velcro closure, fits babies from 8-35 lbs. Velcro has laundry tabs to protect your wash load. The velcro is great for tired moms and dads who don't want the fuss of snaps. Gentle double leg gussets prevent messes and are covered for baby's comfort. STAY-DRY: Soft Stay-Dry Charcoal Bamboo Fleece Inner lining keeps baby's skin dry and comfortable and includes the other benefits of bamboo: stain resistant, contains antibacterial and thermal regulating qualities ALL IN ONE/LEAK GUARD: An Absorbent and trim 4 Layer Soaker (2 layers of bamboo/ 2 layers of microfiber) sewn-into this diaper makes it an all-in-one. The Leak Guard on the front inside of the diaper is ideal for tummy sleepers and lil' guys. BONUS FEATURES: pocket opening for extra inserts and the addition of an absorbent 13.5in. long 5 layer charcoal bamboo insert; ideal for heavywetters, travel, nap and night use! 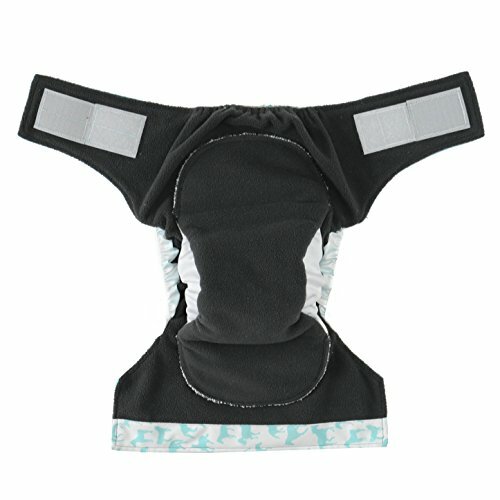 Covered double leg gussets for baby's comfort and leak protection. Front leak guard for lil' guys and tummy sleepers. WATERPROOF/EASY: Breathable waterproof PUL outer lining, no cover necessary. Velcro tabs make this diaper as simple as a disposable for tired Moms and Dads.